I’d stopped at a local Mexican grocery store last week to buy some tortillas. As luck would have it, I timed my visit to coincide with empanada night. I’d had the bison spelt empanadas on a previous occasion and couldn’t leave the store without a little to-go container of bison spelt goodness. When I got home, I sat at the table to tuck into my snack and the ghosts of dinners past gathered round. ‘I want some, I want some, I want some’ they chorused in triplicate. Still, they ate my empanadas and that’s how tonight’s dinner was borne. I had ground bison in the freezer. I looked up a recipe for empanadas. I bought butter and canned chipotle peppers. It required a little bit of work, of course. I’m not sure what it is about the prospect of making pastry dough, but I dread it much like I might dread an annual medical check-up. Once I throw some flour and salt and butter in the food processor, it’s fine, but to get to that point I have to spend hours fixating upon the ‘horror’ that awaits me. 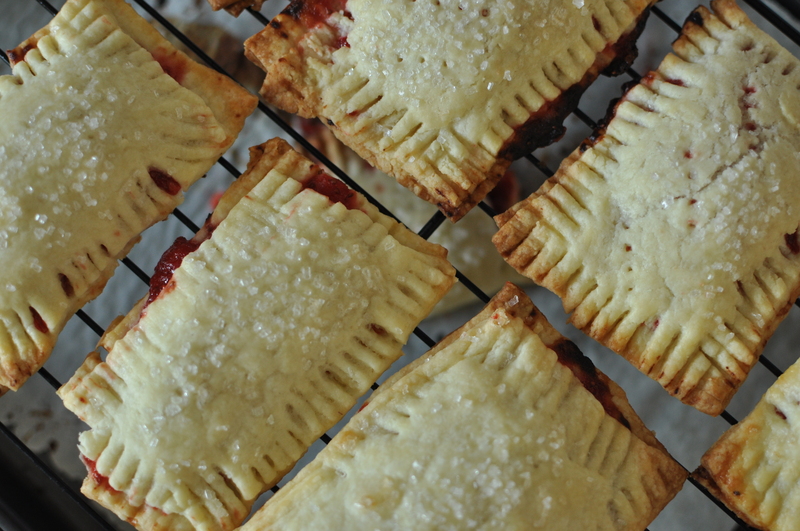 I was still in the midst of dreading making the empanadas, when it occurred to me: I was going to be dabbling in pastry anyway, why not make some homemade pop tarts while I’m at it? I’d seen an adorable version on Pinterest, complete with heart cut-out and ever since I’d had my mind set on making pop tarts. Even though I’d choose chocolate over fruity pie-like creations most days. When you spend the bulk of the day preparing dinner, it tends to be ready….early. 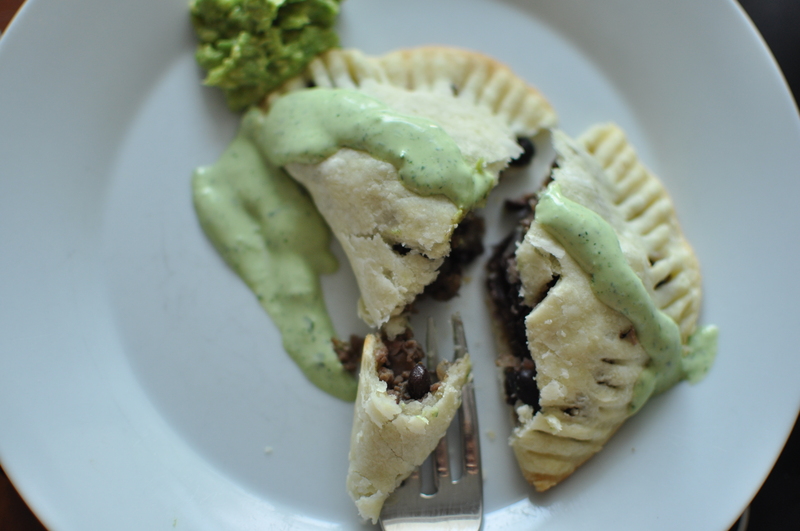 So at just after 5pm, I gathered the Johnson boys and we sat down at the table for my slightly less spicy version of bison empanadas with cilantro cream and guacamole. It figures: the one night of the year that I’m on the ball with dinner, I get an impromptu invitation to dine elsewhere. It was just past 6 when I pulled the pop-tarts out of the oven. I tasted a warm one and nearly kicked myself for spending so much time making something that tasted so…..meh. After the longest walk-around-the-block in history, we arrived home and I passed out a plate of pop-tarts. Apparently hot pop tarts are meh. 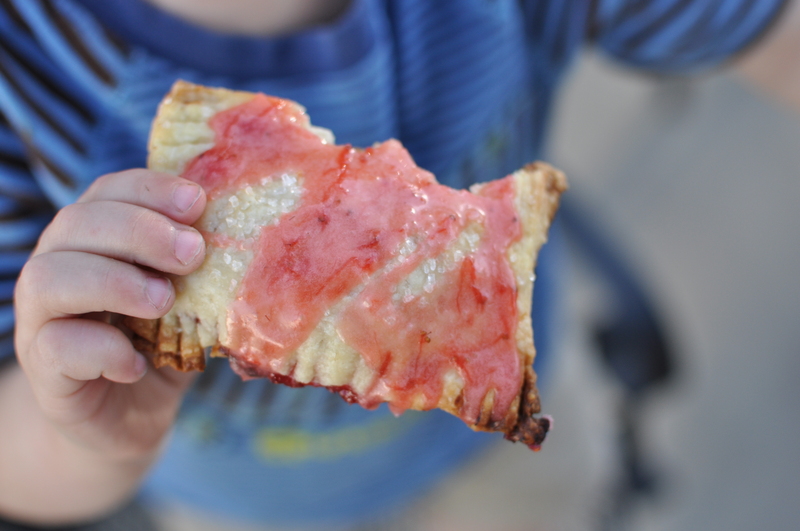 But luke-warm pop tarts with homemade strawberry icing drizzled on top? So much easier if you use store-bought crescent dough. I refuse to think of that as cheating. I am assuming the leftovers are gone???? Recipe for the bison empanadas (meat pies? ), please. But I’d prefer for you to to come and make them for me if possible. Kate, do you mean you use crescent dough for pop tarts? Sort of a toaster strudel effect, no? Ma, no recipe: saute onions, jalapeno, garlic, brown bison, add can of black beans, cumin, salt, pepper and at the end stir in some chopped chipotle chile in adobo. It’s a decent approximation of the real deal.